The original discovery of these quartz crystals in 2004 was so unusual that it was actually documented in a major industry publication. Each specimen contains three types of inclusions: oil, gas and water. The yellow that you see is petroleum, the gas bubbles are primarily methane and the colorless inclusions are water that was incapable of mixing with another component. 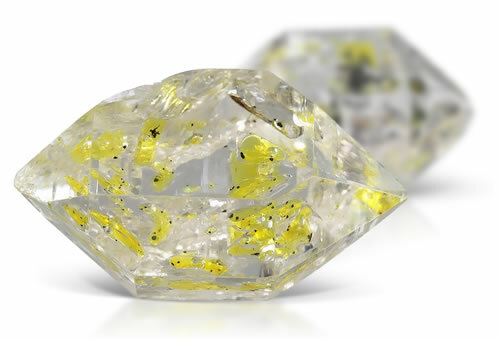 Such unique inclusions are exciting enough for rock hounds across the globe, but when you add in the fact that the crystals are doubly terminated like Herkimer quartz, you have a combination of attributes that simply can't be ignored by enthusiasts. Petroleum quartz will contain petroleum and might contain liquid, two-phase and three-phase inclusions, negative crystals, minerals, needles, rutile and iron particles.